The team CVS tutorial will start by working offline and creating a simple project. Once the project is created, instructions will be given explaining how to commit it to the repository. Create a new "General" project using File > New > Project > General > Project. Use a unique name as the project name (e.g. JanesTeamProject). 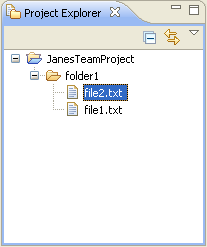 Create a folder named folder1. The project can be continued within this mode but unless the project is committed into the repository, others on the team will be unable to work on the project as well.